Although little extractable gold was found in Humboldt County itself, the area's early history was tied to the gold rush. Gold seekers flocked to the coastal towns which became prosperous and notoriously rowdy. 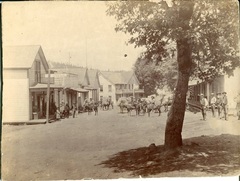 Supplied by long trains of pack mules, miners headed inland. When get-rich-quick dreams faded, many returned to the coast and settled. The first railroad in California, a horse-drawn wagon on rails, was built in 1855 to transport goods from the docks into Arcata. Thousands of placer miners, using sluice boxes, rockers and some panning, worked claims along the Trinity and Klamath Rivers. By the mid 1850s, companies were using hydraulic mining with cannon-like monitors shooting powerful streams of water against gold-bearing rock. Whole mountains were washed away, rivers were clogged with gravel, and occasional landslides resulted. Later, floating dredges worked the river bottoms, and shafts were blasted into rock. Some gold mining, mostly placer, continues today. Some early gold seekers came from China. Their hard work for low wages caused resentment among American miners, and many were driven from the gold fields. Chinese emigrants settled in towns as merchants, launderers, household servants and vegetable growers. Some worked in the logging and fishing industries and helped build railroads. Eureka's Chinatown was on E and F streets between 4th and 5th. By the 1880s, economic competition and conflict among rival tongs increased hostility toward the Chinese. In February 1885, a city councilman was killed in tong crossfire. In the next days, angry citizens forced all Chinese out of Eureka. Arcata and other communities followed, and within a year nearly all the county's Chinese population was gone. Local laws and attitudes continued to prevent settlement of Asians until the 1950s. In the 1860s, another mineral became important when oil was discovered in the Mattole River Valley. Several quickly formed companies drilled the first oil wells in California. Initial success raised hopes for a prosperous oil boom, but retrieving enough oil soon proved uneconomical. The town name of Petrolia is one reminder of Humboldt's brief oil days. In the 1890s and 1950s, copper was mined in the Horse Mountain area, but was too expensive to transport.